Located in the heart of midtown Tulsa, this 1991 custom built traditional home had potential as the perfect fit for a family, but rooms defined by sharp angles and rows of stately columns set a tone for formal, separate spaces. 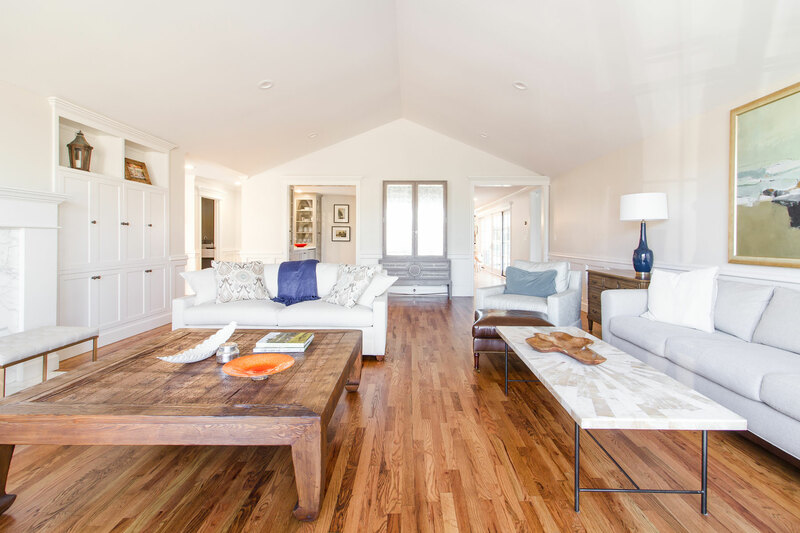 Working together with the new owners - who believed in the home's possibilities - we were able to transform the space into a more modern open floor plan with flowing, spacious living areas focused on family and entertaining. The home renovation began with updating the exterior - redesigning from ground to roofline with modern, clean lines. 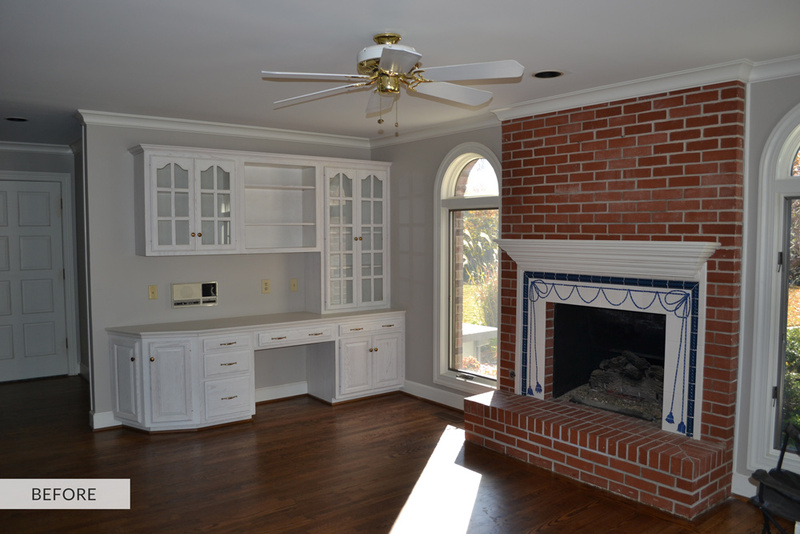 The existing brick & trim were painted in neutral colors. Windows were replaced to allow more natural light throughout the house. To make the home more open and welcoming, overgrown landscaping was refreshed and simplified, the front door expanded for window-paned double doors, and the front steps widened and extended to broaden the entryway. Details were added for character including custom shutters, iron railing for the front porch, and reclaimed pavers for the front steps and driveway accents. Reconfiguring the existing driveway to a circle drive allowed for easier access and curbside appeal. 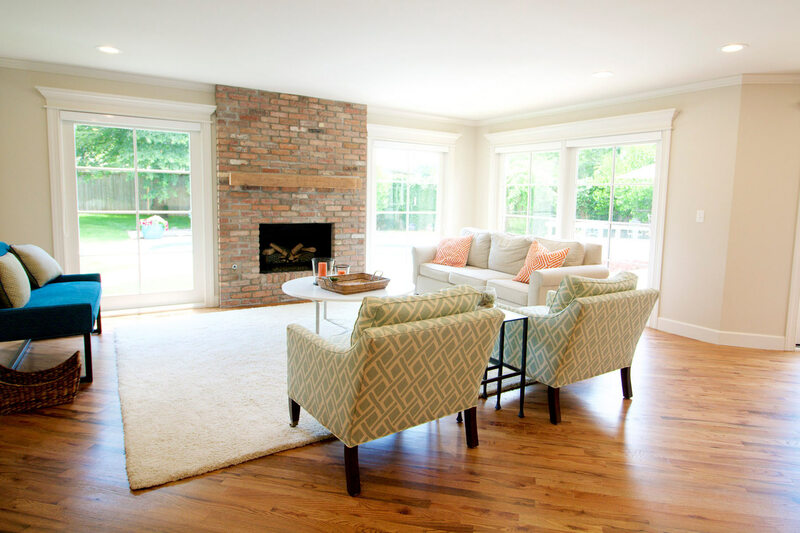 Transformed by replacing the front angled windows and new roofline, the living room's new design added clean & simple wainscoting and custom built-ins on each side of the fireplace. 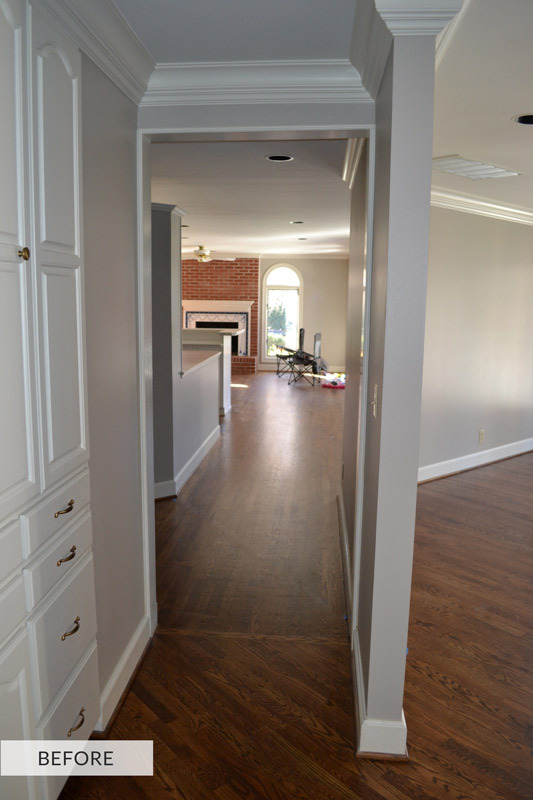 The original hardwood floors were kept and extended throughout the first floor, and the existing fireplace's porcelain tile was kept and accented with new custom woodwork to replace the brick and brighten the space. The six columns dividing the living room from the former dining room were replaced with a partial wall with extra wide, open walkways on each side. 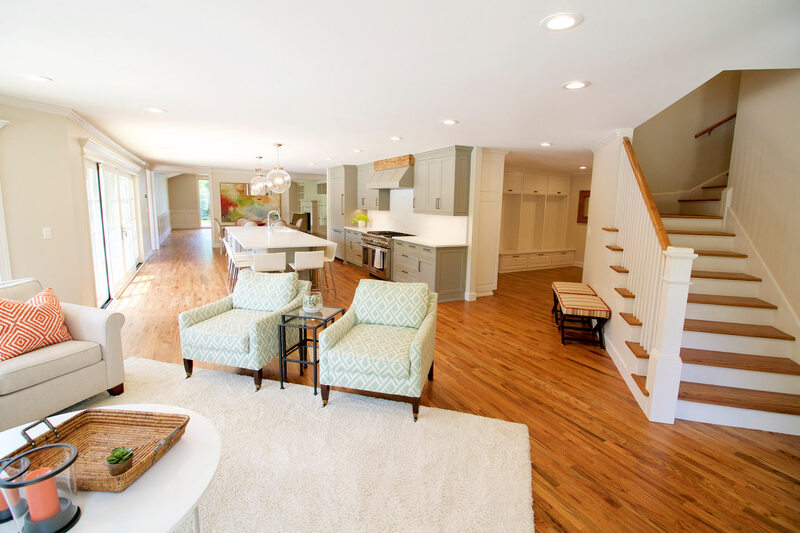 Neutral colors were used throughout all the rooms for cohesion - natural tan on the walls with white trim. 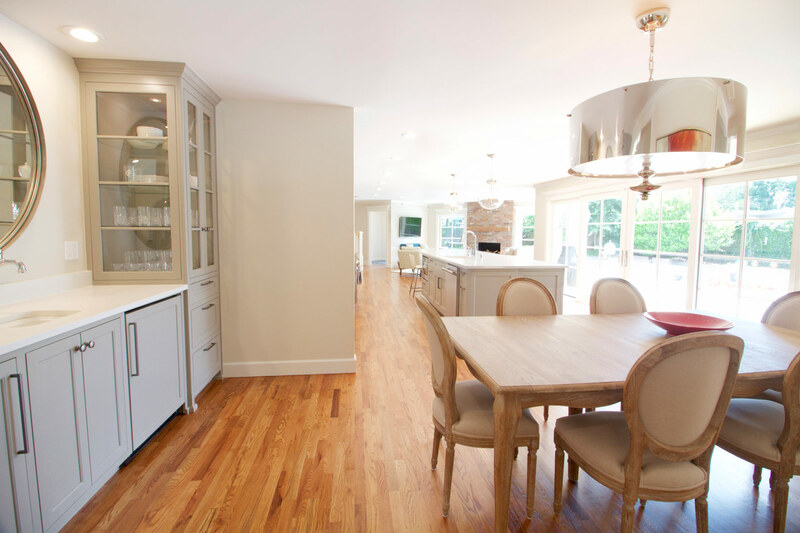 For a larger and more practical use of the home's space, we replaced the previous wall of columns separating the dining room with a partial wall and realigned the room with the kitchen to open up the family living space. The open, airy dining room features built-in custom storage with lighted glass cabinets and wetbar. 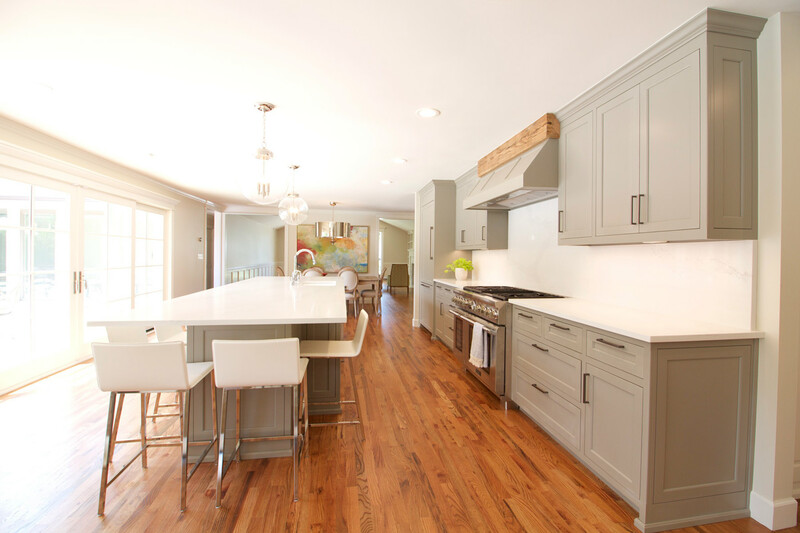 Light Caesarstone counters are offset by the painted gray cabinets in the dining room and kitchen. 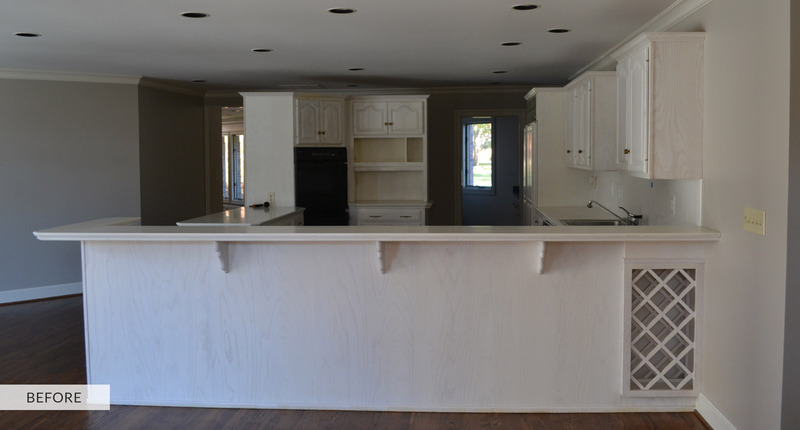 Formerly a space boxed in by cabinets and counters, the kitchen is now clean, modern, and light. 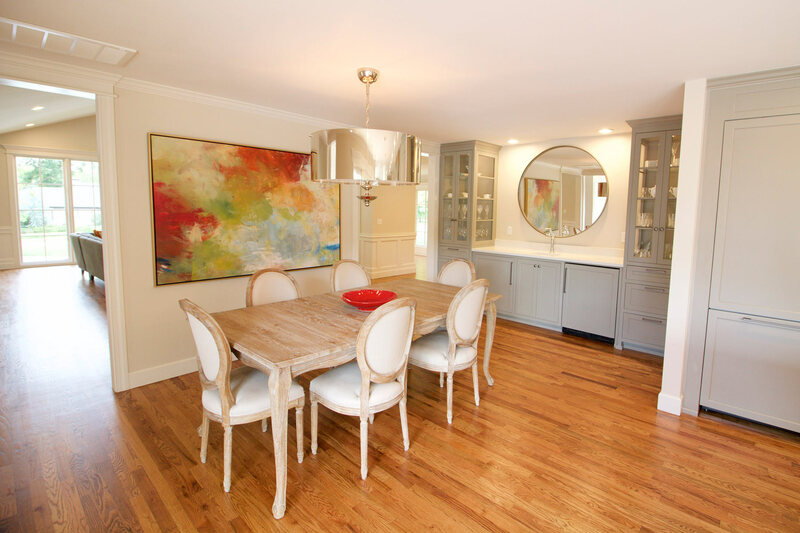 We opened up the area by replacing the surrounding cabinets with a single oversized island with built-in storage & eating area and moving the kitchen space closer to the the exterior wall - now filled with french doors and full windows to brighten and warm up the space. The kitchen features clear glass pendant lights, Caesarstone counters and backsplash, and Thermador panel appliances. 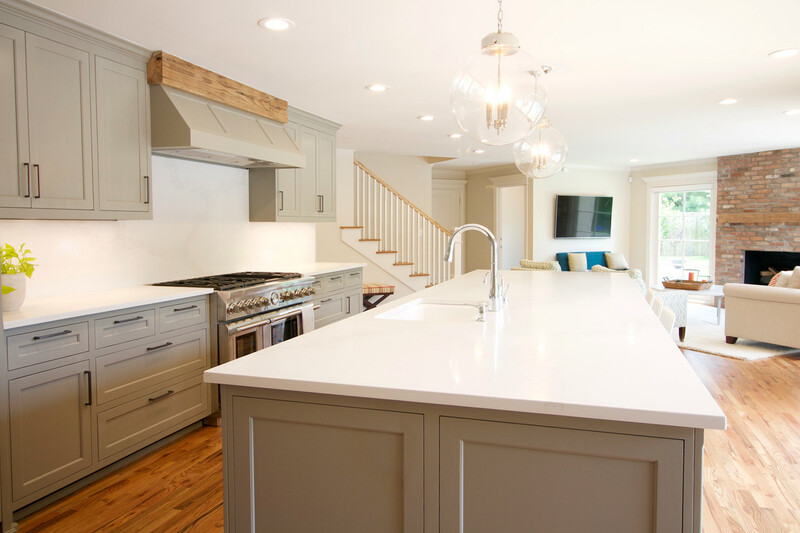 The custom built shaker cabinets are painted gray and a reclaimed wood beam adds a detailed finished look to the now functional and inviting space. 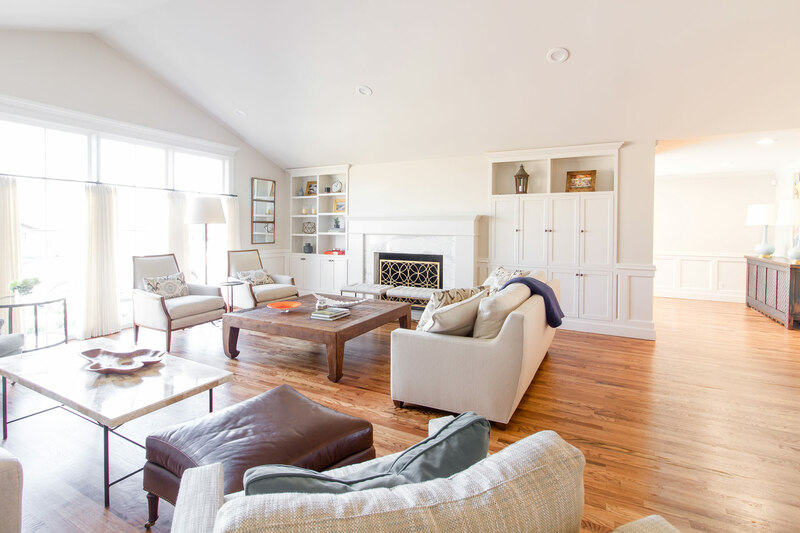 By reconfiguring the layout of the kitchen to flow directly from the dining room and opening up the previously hidden staircase, we were able to make the family living area less formal and more spacious and functional. The floorplan is open yet each space is clearly defined - perfect for entertaining groups of friends or time with the family. 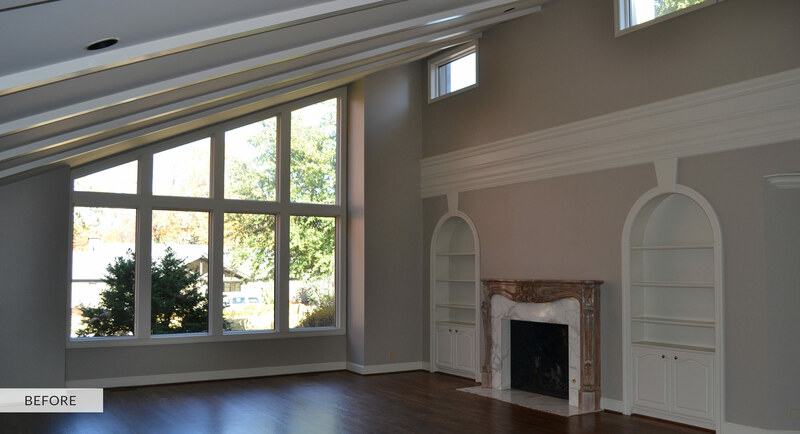 Large windows were added to the sitting room to brighten the space. The existing fireplace brick was painted and a reclaimed wood beam mantle now adds character and dimension to the room. 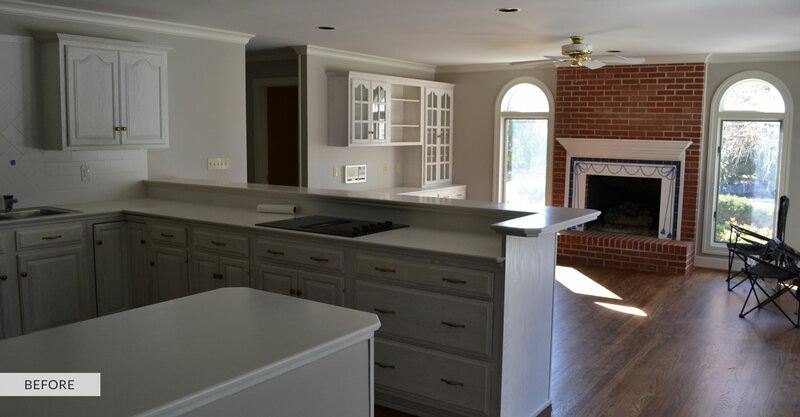 One of the biggest transformations in this home remodel was the reconfiguration of the space previously used for the laundry room, pantry, and back entry. By opening up these rooms in conjunction with the redesign of the kitchen and stairs, a new area was carved out for three functional spaces. 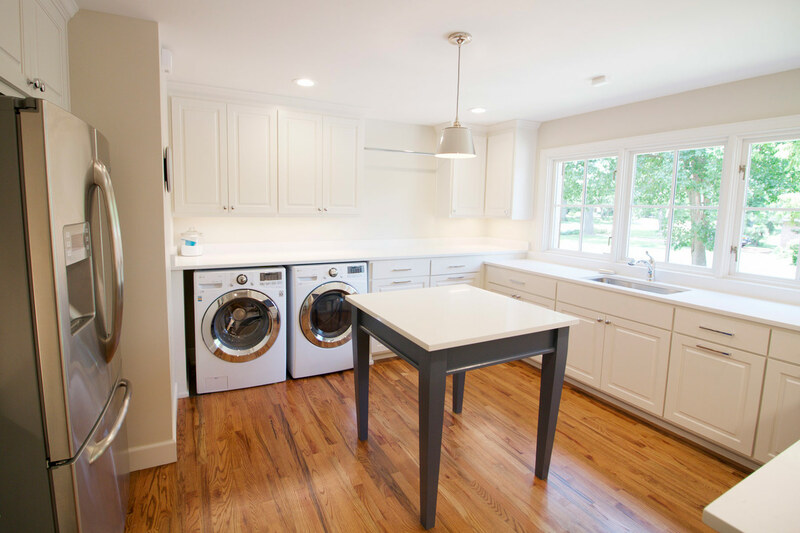 The new spacious laundry room provides ample counter space including a center island, tons of built in storage, and space for a second refrigerator. The new sink is perfectly aligned with the row of windows to let in loads of light and makes it easy to check on the kids outside while working on daily chores. 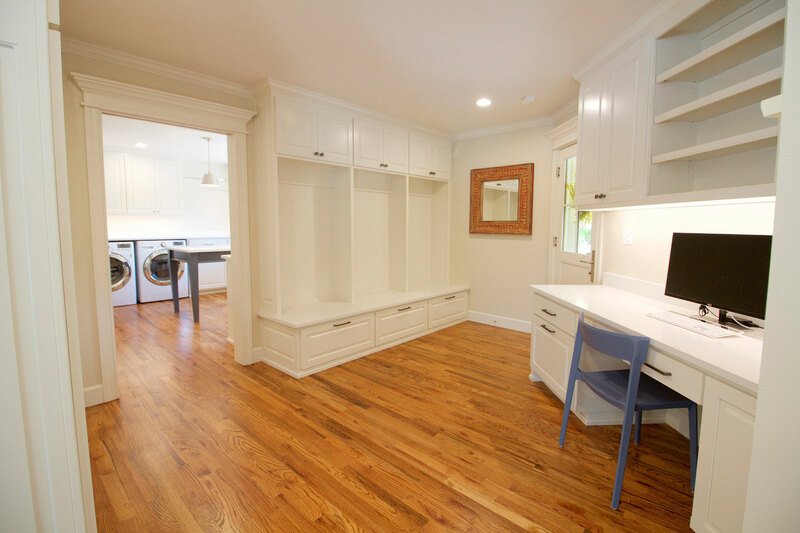 Mudroom style lockers were added to the back entry space to keep the family organized. 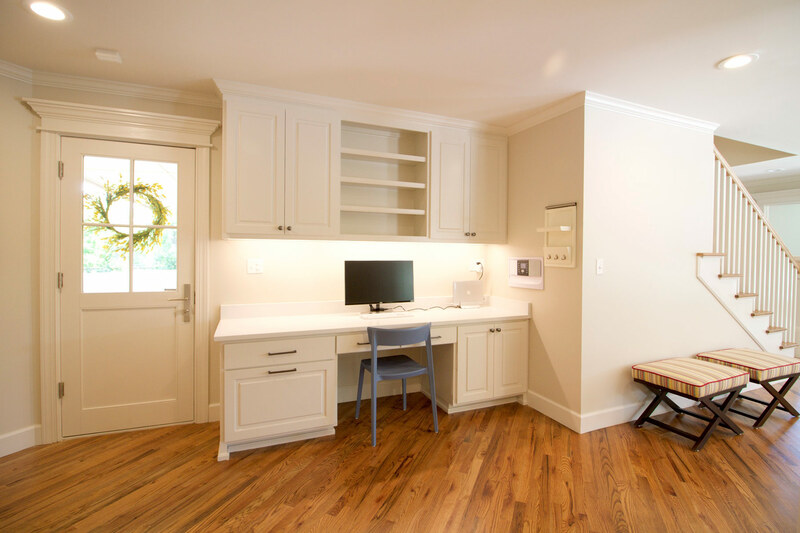 A custom built-in desk provides an organized workspace just steps away from the family living area. The finishing touch on the home remodel was the unique powder bath. We completely revamped the traditional powder bath - beginning with a tiled accent wall featuring Ann Sacks Penny Tiles. Thibaut wallpaper was added to the remaining walls for subtle detail. The original sink was replaced with a floating vanity using the same Caesarstone as the kitchen and nickel hardware.